Perhaps the most discussed topic of the BMW i3 is the implementation of the range extender for the North American market. In an effort to have the vehicle qualify for the California Air Resource Board BMW set restrictions on how and when the range extender can turn on, effectively reducing the utility of the REx. These restrictions are most apparent when attempting to use the car for long journeys which include drastic increases in elevation. 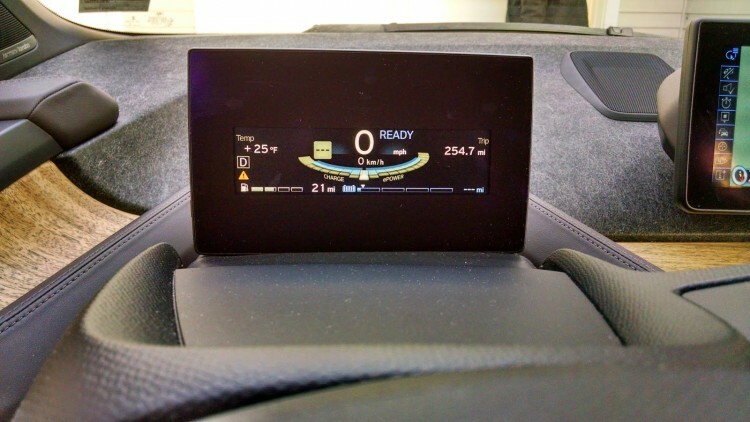 This topic has been covered here and on every other EV site extensively, and recently it was announced that BMW is working on a software update that will allow, under certain conditions, the range extender to come on much earlier than the 6.5% threshold it currently uses. I am actually beta testing that software for BMW now, having had it installed on my i3 just last week. The new software also includes some other updates that will be standard on 2015 i3s and will be uploaded to current i3 owners sometime early next year. 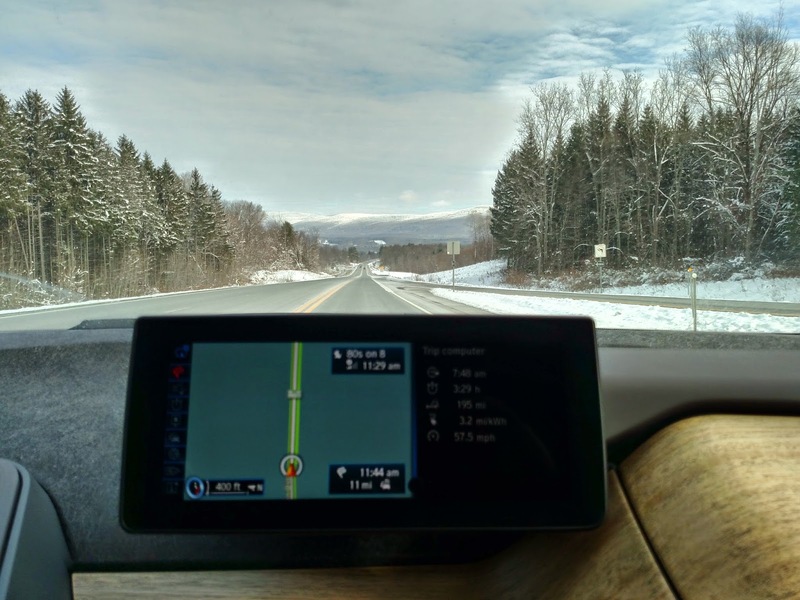 However this post will detail a New Jersey to Vermont road trip that I took a few weeks ago, just before I had the new software update. 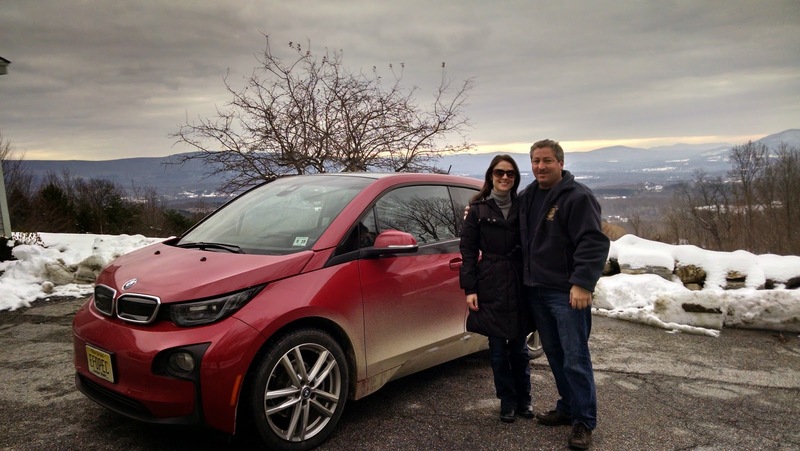 My in-laws live in Vermont, and I had been wanting to take this trip with the i3 ever since I got it, but I just haven’t had the time. Once I knew I would be getting the new i3 software which would be adjusting how the range extender would work, I knew I needed to make the journey before I had it done, so I could perhaps compare the difference in performance the next time I go. The Active Cruise Control is awesome. I don’t think I’ll buy another car that doesn’t have it. I have taken the car on a few 200+ mile round trips, having the ability to charge up before heading home, but this would be much further, about 250 miles there and about 210 miles back home. The trip there would be longer because we were meeting at a restaurant farther into Vermont before heading back to the house. 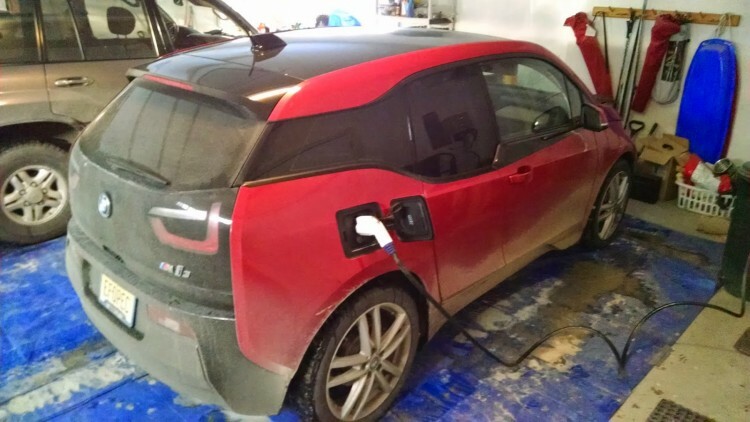 A couple of years ago I installed a Clipper Creek CS-40 at my in-law’s house, knowing that the day would eventually come when I drove an EV there, but I had never used it until now. 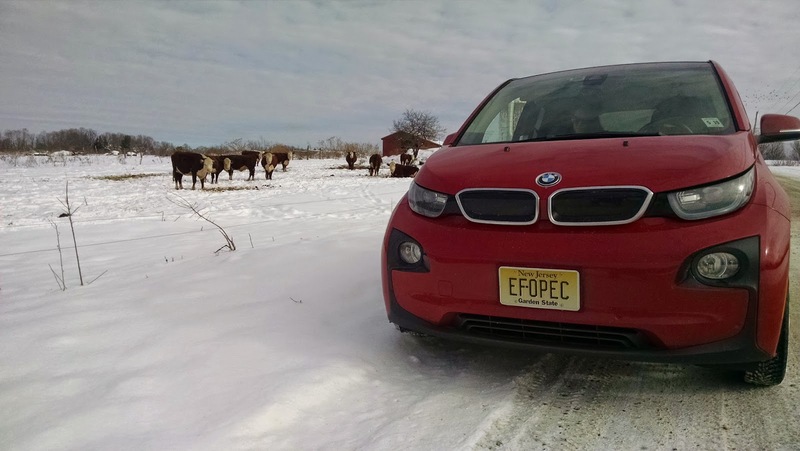 My previous EVs (MINI-E and ActiveE) would have just been too much of a hassle to try to make this long of a trip, but the range extender is perfect for an occasional trip like this – or at least I hoped it would be. 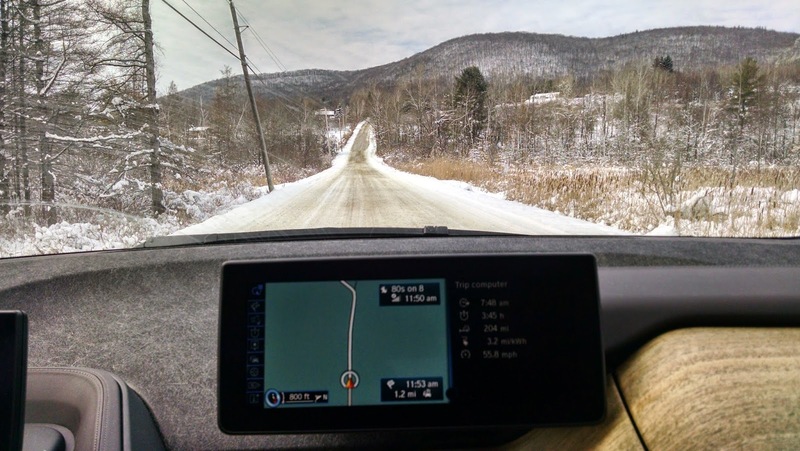 Most of the roads in Vermont were covered in ice and snow. My new Blizzak snow tires performed very well and I definitely recommend them for i3 owners who need to drive in the snow. The truth is, I really didn’t know if such a long trip at highway speeds, which would include an overall elevation gain of nearly 1,000 feet would be doable without the car going into the dreaded reduced-power mode, where the vehicle slows down for a while so the REx can replenish the battery a bit. Also, in the final 50 miles of the journey I needed to climb 500 feet before ascending 500 feet and then climb about 700 feet to our destination. My wife and I set out early on a brisk morning with the temperature being only 15 degrees when we left. I didn’t precondition the battery or cabin, and the total weight we were carrying was about 450 lbs between me, my wife and the items we were bringing up to her parents’. I topped off the gas tank the night before and left fully charged. The trip is nearly all highway and my plan was to set the cruise control for varying speeds between 70 mph and 75 mph to see how fast we could go with the REx maintaining the state of charge. I would drive the whole way there in Comfort mode and possibly use Eco Pro for the return trip. A few blocks from our destination we came across some cows. 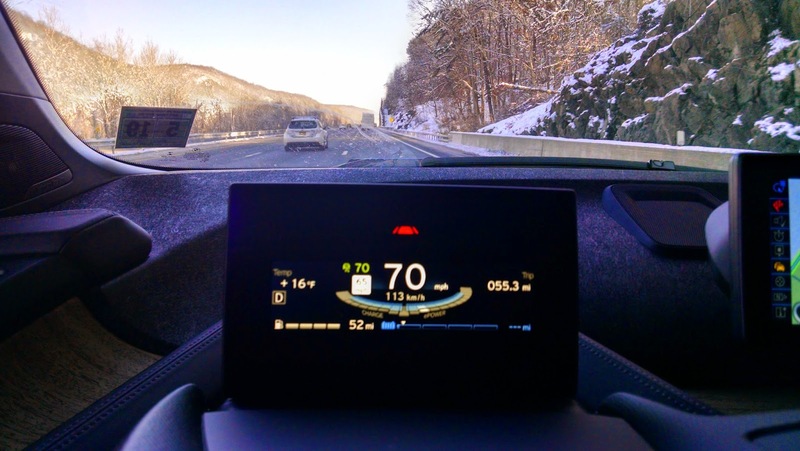 The combination of the very low temperatures, using the heated seats, cabin heat and driving 75 mph meant the range extender turned on after only 48 miles. That’s the earliest I had ever seen it turn on before. I had barely made it to the New York State border and I was already running on gas. So now I had a little over 200 miles to go and it would be all done on the range extender. I figured I’d need to stop three times so we searched the GPS for gas stations that were directly along the route and at the intervals we needed. I wanted to stop when we had about 10 miles of range left and we were able to pretty much get close to that on all three stops. I needed to stop three times to fill up on the way there. We made the first stop right about at the 100 mile mark which was about an hour into the journey. My wife laughed at how quickly the tiny gas tank filled up and we came up with the idea that she would time me on future stops to see how long it took to fill up. She would use the stopwatch app on her phone and we would start it when we exited the highway and stop it when we were back on the highway to see just how long the diversion was. We averaged a little over 2 minutes per stop and the best time was one minute, forty eight seconds. All three stops added a total of about seven minutes to the trip – not exactly much of an inconvenience. The car looked like I was off-roading all day when we arrived. I finally got to test out the EVSE I installed at my in-law’s house over two years ago. Thankfully it worked. For most of the trip I had the Active Cruise Control set to 70 mph, but I also spent some time with it set to 73 mph and 75 mph. As I expected, 70 mph seemed to be the sweet spot for holding the SOC. Even with inclines that lasted for a mile or two the car never went into reduced power mode. When I set it to the higher speeds it could maintain the SOC on flat ground, but the inclines had the SOC bar graph getting dangerously close to completely evaporating so I kept it at 70 whenever I was going up any kind of hill. One thing I can say, the ActiveE Cruise Control really rocks for long drives like this. It holds the speed, slows down when the vehicle ahead reduces its speed and maintains a nice safe distance. I used it for virtually the entire trip and it is definitely worth the cost if you do a lot of highway driving. So, we made it without ever going into reduced power mode. I guess there is no need to do a comparison trip with the new software since this trip went flawlessly. The only thing I can think of doing is possibly trying the same trip with the ACC set to 75 mph the whole way to see if the new higher REx buffer allows me to maintain the faster speed. As it is now though, 70 mph is definitely the magic number for long distance REx driving. If most of the trip is on relatively flat terrain, the SOC buffer is big enough for sudden bursts of speed for passing and to sustain climbs for a few minutes and a couple of miles. Even though it worked out fine for me, I’m happy that BMW is increasing the battery buffer so longer, sustained mountain climbing will be possible without going into reduced power. I haven’t had enough time with the new software to really comment on how well it works yet but I’ll do that soon. The trip home the next day was pretty uneventful. I did precondition this time and drove the first half of the way in Eco Pro mode. It was also about ten degrees warmer. All that combined to allow us to go 15 more miles on battery than we had the day before, giving us a total of 63 miles before the range extender turned on. We arrived home with 462 miles on the trip odometer and an average consumption of 3.4 miles per kWh. I filled up with gas about 1.5 miles from my house so we left and arrived with a full tank. Including the final stop to top off we made seven stops for gas (3 going and 4 returning) and bought a total of 9.87 gallons of gas. 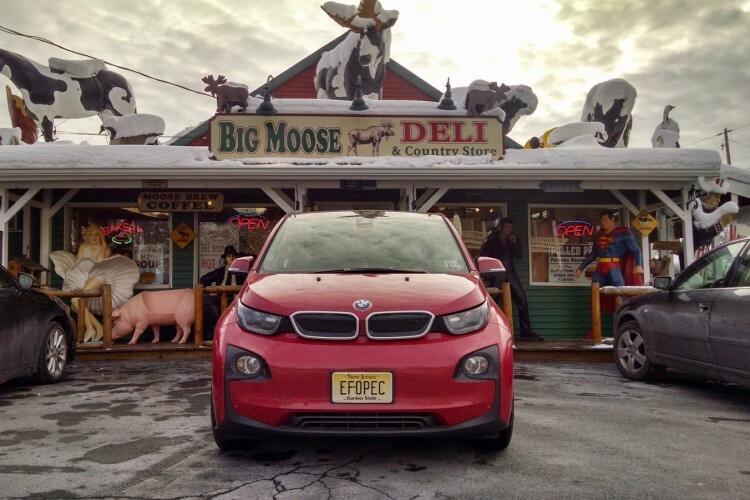 We drove 111 miles on battery and 351 miles with the range extender running and averaged 35.5 miles per gallon. That’s a little less than what I usually average for the REx, but this was a continuous 70 mph for the vast majority of both legs of the trip so I expected it to be lower than usual. 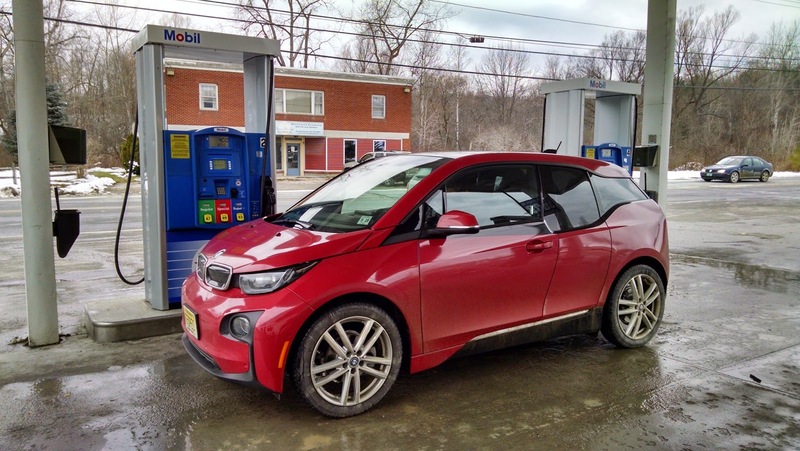 If we had taken our other family car like we usually do for our Vermont trips, we would have needed 19 or 20 gallons of gas or about double what the i3 needed. 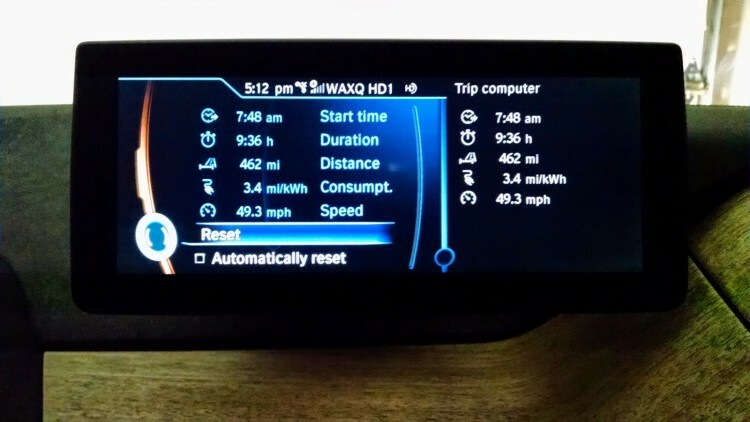 In conclusion, these kinds of journeys are definitely not what the i3 REx was really developed for. The tiny 650cc motorcycle engine isn’t really engineered to operate for hundreds of miles at a time and I’m sure if it was subjected to this kind of use every week it would certainly have premature mechanical issues. However using it as I do, for the occasional 10 or 20 miles here and there, or the final 3 miles on some days just to make it home plus a road trip every month or two, it’s really a great alternative to spending an additional $20,000 for a battery that’s triple the size of the i3’s. The range extender model is a good stop-gap measure until there is a decent DC fast charge infrastructure in place, which is really the ultimate goal. BMW has some very good news with regards to DC fast charge infrastructure that they will be announcing very soon, perhaps even at NAIAS in January. They are making a significant investment in this area and I believe the EV faithful will be very happy when the news is announced.